Pushups have long been the gold standard when it comes to fitness and are a simple way to test athleticism and strength. Since the pushup uses almost every muscle in your body, you might be tempted to add a few sets to your daily workout, poor technique and sore muscles can render pushups less effective. While pushups can help strengthen your body, they should not be used as a substitute for daily physical activity for health and wellness. When you perform a pushup, you're not just using your arms. The exercise also engages your chest, core and leg muscles as you hold your body in the plank position. This makes the simple pushup an effective way to engage all the major muscles groups in your body during strength training. 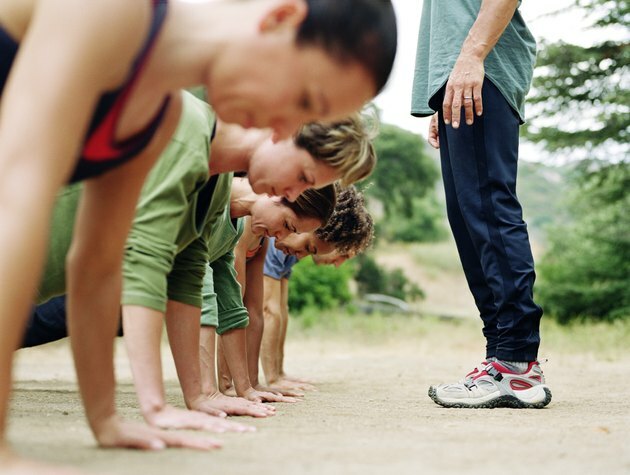 Daily pushups are too often performed incorrectly, reducing their overall benefit. When doing a pushup, your hands should be shoulder-width apart and flat on your exercise mat. Your back and legs should form a straight line, and when you lower yourself to the mat, that line should be maintained. If your bottom is too high in the air, your back sags or you don't lower yourself far enough, your pushups are not effective and can even put you at risk for injury and strain. Also, doing pushups daily may not give your muscles sufficient time to rest and recover, which can result in further strain. The idea that exercise requires expensive gym memberships and equipment is false. Daily pushups prove that you can perform effective strength-training exercises at home, with no equipment. You simply use your body weight and endurance to implement a daily routine. While an exercise mat can make your pushups more comfortable, you don't need it if you do your pushups on carpet. While pushups can help you build strength and muscular endurance, they likely won't help you lose weight or become healthier on their own. Cardiovascular activity must be added to burn fat and build a healthier heart. The Centers for Disease Control and Prevention recommend getting at least 150 minutes of moderate-intensity cardiovascular activity a week. Supplement your daily pushups with walking, running, biking or dancing to meet this recommendation.